Writing historical fiction is no mean feat, as it calls for bold handling of characters which are already entrenched in their casts in time, of depicting situations which are already known to everyone as having unfolded in a particular manner. However, the success of writing historical fiction lies in finding and highlighting the lesser known stories and the alter-facets of the powerful characters and presenting well known events in a new light. Author Kathakali Mukherjee, in her work "Love in the Battleground" makes a bold attempt to present to us enthralling but lesser known stories of a well known period of Indian history, the Maratha Renaissance. I find her intention very brave in the first place as she chooses the very star of the Maratha Renaissance, Shivaji as her protagonist, but very skillfully places an anti-hero too in the narrative in Raghupati, who gradually creates his own space in the readers' mind. While it is easy eulogize an already epic character, the author does not fall for the temptation instead uses her characters deftly to compliment each other. The title of the book 'Love in the Battleground' may sound like a giveaway to the readers in the beginning as to what they can expect in its pages, but then it is historical fiction and without the key elements of love and war, any tumultuous period of history is incomplete. The author again shows control and maturity in handling the narrative as she well balances the saga of Shivaji's battle and political upheavals against the lyrical love story of Raghupati and Sarayu. Both aspects are written and dealt with the right amounts of emotions they deserve. The narrative at times is fast paced and hooks the reader on the journey excitedly, while also allowing for suitable respites at certain points where the love saga takes its episode. The author also provides enough foreground and background knowledge and context for the reader in preparation of the core story, which is an important element for any historical fiction. It was nice to see that the author has not neglected setting the correct context. Also, she has done a great job in her detailed description of the characters, situations and settings for each scene and episode, thus enabling the readers to almost visualize the action and feel the emotion. The result has been a very well written and succinctly bound plot that keeps its readers going with the story from start to finish. 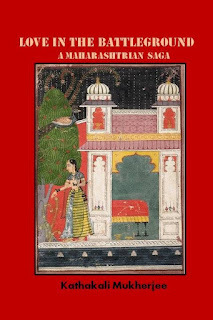 In her note, the author has mentioned that this was her retelling of the historical tale of the Maratha Renaissance which has been earlier written - Maharashtra Jiban Prabhat. Whilst I have not had the opportunity of reading the referenced text, I was quite overwhelmed by reading 'Love in the Battleground' as an independent historical fiction. In my opinion, Ms Mukherjee has spun out a powerful and engaging historical novel which readers will both enjoy reading as well as benefit from refreshing their knowledge of the Maratha Renaissance. Therein lies the success of 'Love in the Battleground'.